A red thread runs between North Terrace and Melbourne Street with two exhibitions showing the creative blossoming – and melancholic beauty – that can come from a collision of cultures, writes art historian Katherine Arguile. Chiharu Shiota’s installations at the Art Gallery of South Australia and Edo Style: Art of Japan at The David Roche Foundation, offered as part of the OzAsia Festival, have more connection than appearances might suggest. One is contemporary, the other historical; one explodes traditional approaches to art and suspends functional objects in aesthetic stasis; the other revels in the tradition of Ukiyo-e woodblock printing and art entwined in functional objects. Their main uniting theme is their country of origin, as well as Art Gallery of South Australia itself, since much of the work on display at the David Roche Foundation has come from its collection. Another of the threads that binds them is the creative blossoming that comes from the collision of Japanese with non-Japanese culture — and the uneasy and melancholic beauty that can arise from the resulting feelings of displacement and liminality. Chiharu Shiota is an international contemporary multi-media artist born in Japan, currently living and working in Berlin. The AGSA has secured her first major solo exhibition in an Australian public gallery for a trilogy of projects: Embodied, a solo survey exhibition in the gallery’s West Wing of videos, installations, drawings and paintings; Absence Embodied, a site-specific installation involving 180km of red wool in the Melrose Wing of European art; and Internal, an externally, publically displayed, 6m-high work of three bright red dresses — evoking ball gowns or period costumes — bound to one another and to the gallery façade by swathes of red fabric. Opposing tensions arise throughout Shiota’s work, and the first sight of Embodied through the doorway of Gallery 9 suggests the reverse of its title: a disembodied dress glows ghostly white out of the darkness. A larger-than-life-sized white dress suspended inside a black metal frame entitled State of Being (2015), it is enclosed within an intricately woven black web of fine cotton, hinting at the body it might once have contained. The dress has lost its functionality while its beauty has been magnified, permanently on display and suspended in time. Walking into Absence, Embodied in the Melrose Wing invites a visceral response: the installation of 180km of red wool which Shiota has used to draw in three dimensions is immersive, evoking blood capillaries and spiders’ webs, clouds and cocoons. In similar vein to The Key in Hand — her installation for the 2015 Venice Biennale — the imposing mass of string is anchored to the room and and to objects on the floor: in this case, a collection of bronze and plaster casts of her family members’ hands and feet. While the rest of the exhibition will be dismantled at the end of October, Absence, Embodied will remain here for two years. The colours of Shiota’s work are stark and primal. Red, white and black: blood, body and soil, red and white the colour of medical emergency, and association with colours particularly significant in Japan: those of its flag, of red and black lacquer, the red and white of Shintō shrine maidens’ robes, the black on white of calligraphy. Through these colours, and her use of multi-media — paper, installation, plaster and bronze casting, video and string — Shiota explores notions of the ties that bind, threads that connect, tangle or are severed; the Japanese notion of en, or fate; of connection with land; of the fragility of the body (particularly pertinent after she experienced a medical crisis of her own) and of displacement. In a mesmerising and unsettling video installation, Shiota’s naked body lies curled on the floor in a white room, encased in coiled transparent tubes pulsating with blood. In another, earlier work, Shiota sits in a bathtub full of muddy water in her claustrophobically cramped Berlin bathroom, far from her birthplace, continually pouring dirty water over herself. In Japan, bath water is for soaking in once the body is clean, not for washing in. The notion of soaping and scrubbing the body while inside the bath water is abhorrent to most Japanese people, and in this video there is a melancholic sense of repeated, failed attempts to return to something that has been lost. A still from Chiharu Shiota’s Bathroom, 1999. Courtesy the artist and Anna Schwartz Gallery. When asked to come up with a single word after an intensive workshop with famed performance artist Marina Abramović, Shiota wrote: “Japan”. Shiota’s art is an exploration of absence, presence, home, displacement, belonging, loss and connection. What makes her a truly great artist is the fluency with which she draws on own private experience while creating work that transcends cultural boundaries, tapping into the universal psyche. Shiota’s work evokes a multitude of symbolic connections as well as visceral, emotional and intellectual responses, making this an exhibition to get lost in and turn over in the mind for weeks afterwards. Edo Style: Art of Japan, at the David Roche Foundation, tells of a chapter from the history of Japan between 1615 and 1868, a period of peace following assumption of control over warring factions by the Tokugawa Shōgunate. Focus moved from Kyoto to Edo (now known as Tokyo) as the centre of government, reinforced by the obligation of all 260 regional ruling lords, or daimyo, to travel to the city every other year in order to show their allegiance to the shōgun. They were expected to maintain their authority and standing through ownership of aesthetically lavish and beautiful objects, and the consequent aesthetic flowering was also cross-pollinated, through trade, with outsider cultures. The exhibition tells this story in a series of thematic groupings — Floating worlds, The light of the Shōgun, Journeys real and imagined, and Ezochi, the land of the indigenous Ainu — through objets d’art, woodblock prints, ceramics and textiles gathered from the vaults of the Art Gallery of Australia and a number of private collections, including that of David Roche, in whose museum the exhibition is housed. Here is a collection of netsuke to pore over, tiny and exquisitely carved, designed for functional use as toggles on strings to hold pouches in place inside an obi belt. 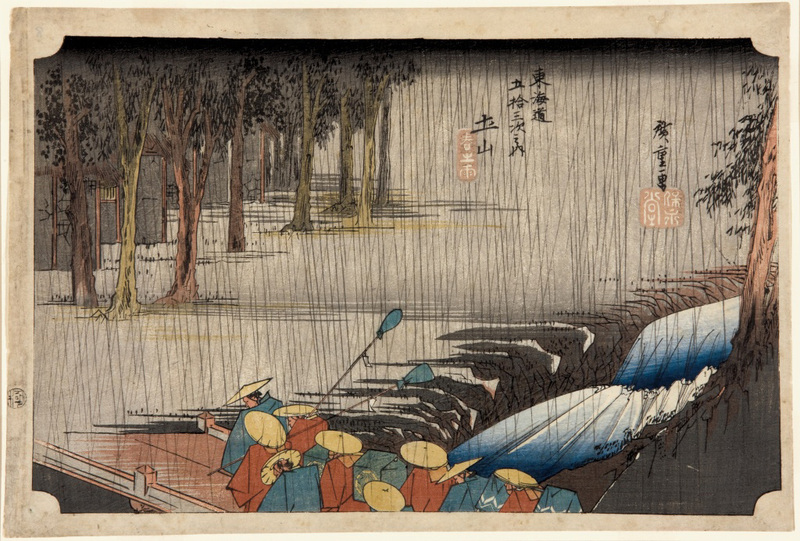 There is a progression of bright woodblock prints from the early to late Edo period. There are fine examples of gold inlaid black lacquer ware, porcelain, screens, a collection of tsuba (guards) for traditional katana swords, and a magnificent ceremonial samurai armour adorned with exquisite detail — the work of hundreds of skilled craftsmen. Freedom from war and the new Confucian ideals in this efficiently organised society allowed for the creation of greater stylistic refinement and a more expansive culture of the aesthetic. There are some interesting oddities: a peculiar woodblock print of an archery contest experimenting — and failing somewhat — with rules of perspective borrowed from European Renaissance masters. In the Ezochi room is a rare scroll depicting people of various nations in their respective costumes, including a rare depiction of Ainu merchants. Trade had opened up during the peaceful Edo period with these indigenous peoples of the islands to the north of Japan, known then as Ezochi, the lands of the Ainu (which include present-day Hokkaido and the Kuril Islands). During the Meiji Restoration that followed, the Japanese government implemented a policy of assimilation, in which Ainu religion, language and culture was weakened and the Ainu population declined. 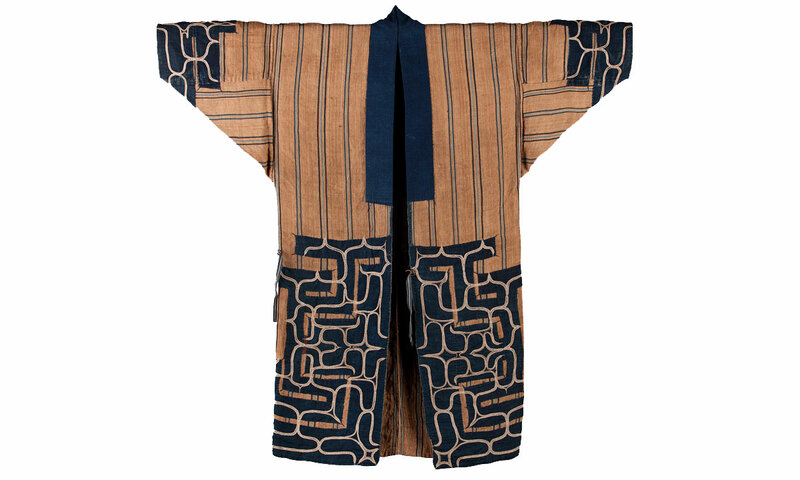 The beautiful Ezochi attus amip robe in this exhibition, dyed in earthy colours and embroidered with surprisingly contemporary, protective patterns, is a poignant reminder of another kind of absence: for almost 200 years the Ainu peoples and their culture were repressed and diminished. Only in 2008 did the Japanese government recognise Ainu culture as indigenous to Japan, prompting moves to end discrimination. The Ezochi robe in this exhibition hangs empty, evoking the absent body that might once have been contained within it, threading the mind back to Shiota’s State of Being. If you go to see Chiharu Shiota’s work at AGSA, be sure visit to the David Roche Foundation in Melbourne Street, too. Chiharu Shiota’s Absence, Embodied will remain at the Art Gallery of SA for two years; Internal will be dismantled on October 22 and Embodied on October 28. Edo Style: Art of Japan is at the David Roche Foundation in Melbourne Street, North Adelaide, until December 1. Katherine Arguile has a BA Hons in Chinese Studies and Art History from Cambridge University, where she was an art critic for Varsity newspaper. She also has a Masters specialising in post-World War II British art from London University’s Courtauld Institute of Art, and a PhD in Creative Writing from the University of Adelaide.